The Charrette applied the first two building types to achieve residential intensification in the project area. The future of Vancouver’s urbanism hinges on establishing a new “Vancouver Special”: a building product that is adaptable, fee-simple, and can build incrementally. A house that adds 6 times more density per lot, yet retains the hallmark characteristics of a door and address on the street; rear access parking; affordable rental unit(s); and human scale. With several comparative advantages over strata buildings and towers, it delivers densities equivalent to tower and podium districts. Consider that Vancouver was platted with 25-foot, 33-foot, and 50-foot lot frontages. These lots are ready-made for sub-division. Two zero-side-yard houses can be built on one lot cutting land cost is cut in half. No premium is paid for land assembly. The width of the house will vary according to the lot frontage. Eight 400 sq. ft. Micro suites (Single Room Occcupancy replacements). The urban house, following on long established traditions elsewhere in Canada, North America and Western Europe, has not been used in our city, having been made illegal in Vancouver since the outset. Yet, it has a proven track record for building high density neighbourhoods, and shaping streets and urban spaces that are highly supportive of social mixing. The Streetwall Building assumes that lots will redevelop either individually or as lot assemblies. It combines with its neighbours to present a continuous “wall” to the street, often referred to as the “streetwall”. The measurement of the low winter sun angle in the particular location. The first characteristic builds the “sense of place”, resulting streets and quartiers that delight our senses. The second ensures against shadowing the public realm, down-grading the experience of place of the many in order to bonus the density, and benefit the profits of the few. In Vancouver, between December and January the altitude of the sun in the sky at noon is less than 27° above the horizon. 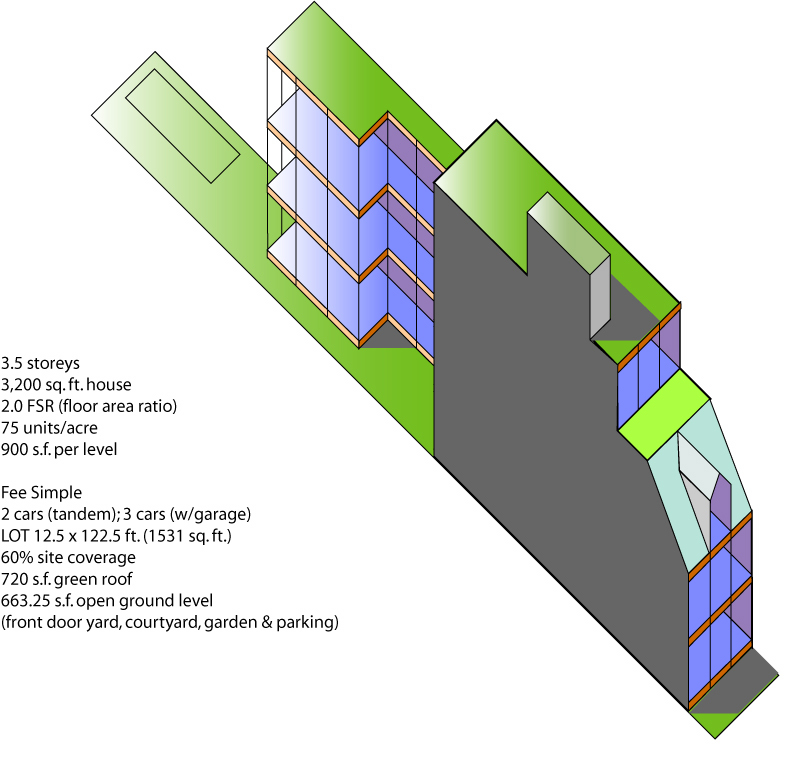 Therefore, the minimum and maximum heights for buildings fronting the street can be determined by the ratios of 1 : 3 (minimum streetwall height is 33% of the width of the fronting street); and 1 : 2 (maximum streetwall height is 50% of the width of the fronting street to ensure solar penetration). On residential streets a ratio of 1 : 4 will still yield a significant opportunity for neighbourhood intensification. The goal of keeping gentrification in check in the Historic Quartiers presents the challenge of suppling of low-rent storefront space for businesses that cater to low-income residents needs. The Charrette proposed developing Co-op Market buildings that would rent space at non-market rates. Markets buildings here in Vancouver, and the world over, are two storey vaulted structures that can accommodate stalls for vegetable sellers alongside kiosk spaces for start-up businesses. These can include butchers, bakers, fish sellers, candle makers, lunch counter operations and coffee shops. In Florence, the upper level consists of empty stalls with brackets for cash drawers. Sellers can rent a stall for the day at the market office, and set up for business. Outside street stalls also change everyday. A second consideration is pairing the Co-op Market Building with an urban room. The social spaces of Granville Island Market, for example, are as much the generator of social mixing for which the site is world renown as what’s on offer inside. In good weather market activity can spill out and take over the urban room. In bad weather, outdoor social activity can find refuge inside the market building. © Lewis N. Villegas, Vancouver, june 2011. The classification of built form by type—rather than style or use—informs critical relationships in urbanism, including: human scale; street aspect ratio; block massing; density; and ownership type or tenure. Urban codes zone by building type, rather than use. Classifying development by type promotes best practices. It enshrines shared visions of place in clear language, and graphic communication. Illustrating the full range of building types envisioned for the quartier, urban codes enable public vetting by local residents, and add predictability to local visions of change. Building proposals using the types prescribed in the urban codes can be fast-tracked for approval, adding reassurance and certainty to the market place. To achieve human scale in the build-out of the quartier building height must be set in proportion to the width of fronting street or urban room. Lewis N. Villegas, “The Gastown Principles”. Vancouver, march 2011.